Bare feet welcome! Sparkling and newly renovated 4 BR, 4 BA family-friendly first level condo with ocean view from deck. 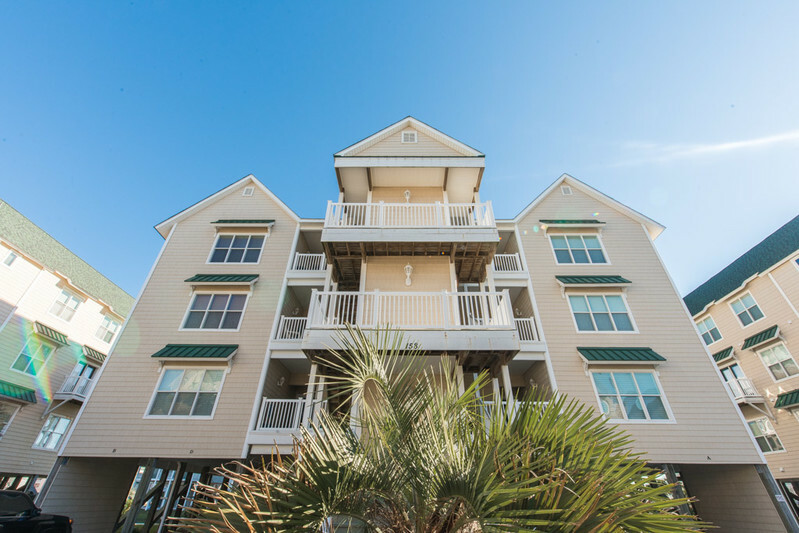 Located in the Islander Villas on the beautiful West end of Ocean Isle Beach, NC. This is true luxury living with plantation shutters throughout, granite countertops in kitchen, crown molding, coffered ceiling, and tastefully decorated to comfortably accommodate your group up to 12. This condo is over 1700 sq. feet with each bedroom having their own en-suite bath. Linens provided including all bed linens and bath towels. Beds are made when you arrive. Bedroom 1-Queen. Bedroom 2-Queen. Bedroom 3-Queen and Twin bunks. Bedroom 4-2 Twins and Twin bunk beds. Amenities: Elevator access, covered parking, 9 ft.ceilings, central heat/air, ceiling fans in all bedrooms, wireless internet, fully-equipped kitchen (with coffee pot and Keurig), dishwasher, microwave, washer and dryer, 5 Tvs, DVD player, Netflix access. Other amenities include outdoor seating area, outdoor shower, gas grill, keyless entry, and a beach wagon to assist with your short walk to the beach. This is a non-smoking, no pets unit. Your rental includes access to the oceanfront swimming pool (with lounge chairs, kids pool, and hot tub), clubhouse and tennis couts. There is an onsite restaurant and Tiki Bar serving lunch, dinner, and some great cool refreshments. All just a short walk from our condo... or pack up the car and drive over as there is plenty of parking available. 3 nights stay availiable before 5/25/19 and after 8/23/19 to enjoy a long weekend getaway. Also available for monthly Winter rental program. You will love to watch the turtles in the pond behind the condo and can even try your hand at some fishing! With North Carolina's beautiful Spring and Fall weather ranging from 75-80 degrees, you will find that Ocean Isle Beach offers sun and fun for most of the year. Ocean Isle Beach is 45 minutes from historic Wilmington,, NC and the tourist town of Myrtle Beach SC. Once you see the view on that deck you won't want to leave! Ocean Isle Beach is the perfect spot for your family vacation.